Actually, a new printing in 2011 added aliens to the cover, which is much better. 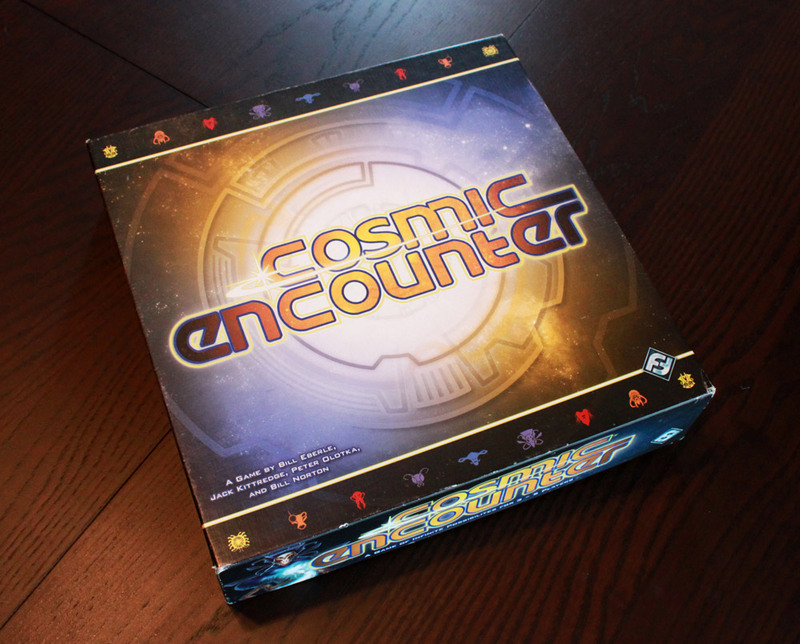 You may have heard me talk about Cosmic Encounter before. This game is a zany, wild, off-the-hook game of alien expansion. Take on one of 50 alien races, each with their own unique game-changing powers, and try to get 5 foreign colonies before your opponents. Sound easy? Maybe. But maybe not. This gem was originally created in the 1970s by a group of guys tired of rolling dice in Risk. Since then it has been published and re-published, refusing to die as it passed from publisher to publisher, edition to new edition. 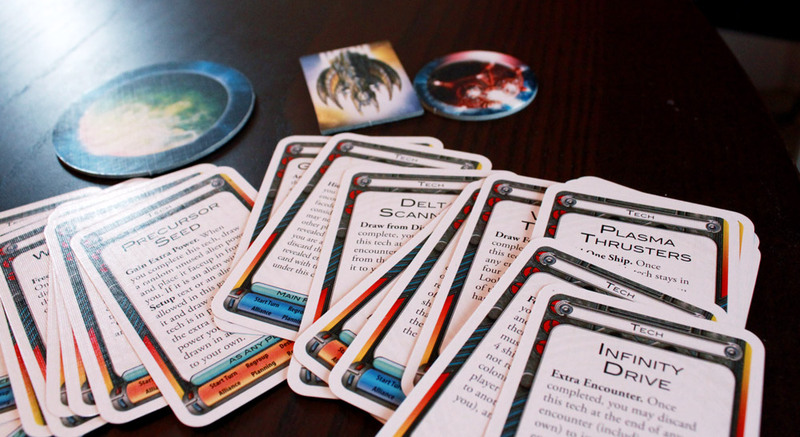 The latest version, released in 2008 by Fantasy Flight games, is the culmination of years of playing, refining, and inventing alien race after alien race. There is a reason why Cosmic Encounter has lasted so long. Each player is given a single Alien race (actually, they are randomly dealt 2 options, giving them a choice without overwhelming them with 50 options), with the goal of trying to gain 5 foreign colonies by landing their ships on other player’s planets. Each turn is an Encounter, where destiny sends the current player to another system, where they must engage with one planet. Players have the opportunity to select the ships they will send, and ask any of the other players to ally with them. Then they must choose an encounter card from their hands simultaneously, revealing them at the same time, and seeing who won the encounter. Most encounter cards are attacks, with an attack value. These values are added to the number of ships present, with the highest total winning; but players (and their allies) can add Reinforcements in order to tip the balance. The winning team destroys all of the opposing ships (including allies), sending them to the central “Warp” area. An offensive win grants all players involved the freedom to land their ships on the targeted planet, gaining them a colony. A defensive win prevents anyone from landing a colony, while defensive allies get to draw cards or recover ships from the warp. However, players may also play Negotiate cards instead of attacks. If both players play Negotiate, they have one minute to come up with a deal to exchange cards or colonies. (Incidentally, table-talk is allowed, so players may feel free to convince each other to play Negotiates.) However, if one player plays a Negotiate card and other plays an Attack, the Attack automatically wins – but the loser gets to steal cards from his or her hand as compensation. The game ends when one player has 5 foreign colonies at the start of an Encounter. 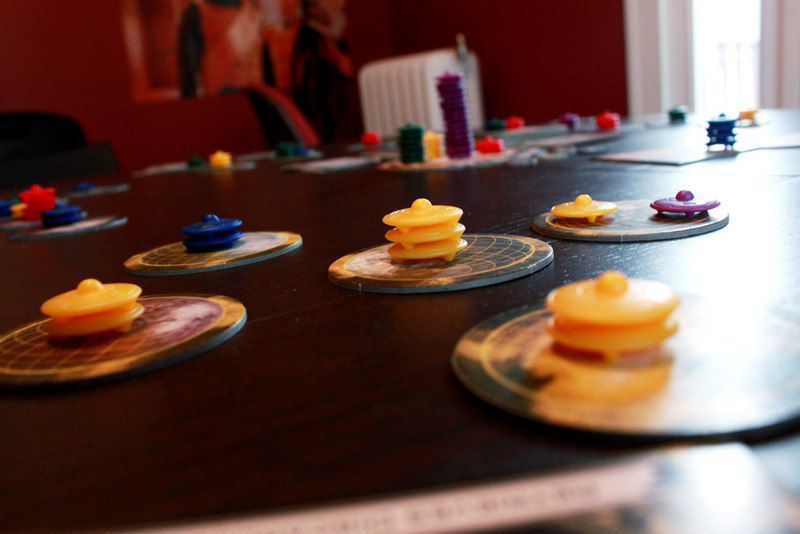 The rules of play are pretty straightforward, however, the Alien powers really throw a wrench in the gears. Rather than sticking with simple “+1 to this stat” powers that many games feature, the powers of each alien race are wildly unique and dangerous. Powers do have a range in complexity – some powers simply let players nab cards from the discard pile at certain times, or use Negotiate cards to win attacks, or to join up as an ally even if not invited, while others are significantly more extreme, such as never losing ships to the warp, multiplying their attack cards by their number of ships instead of adding, or even winning the game by losing all of their ships to the warp. With 50 powers available, every game takes unexpected twists and turns as powers interact in unexpected ways and force players to re-think their strategies. Just How Cosmic Is This Encounter? 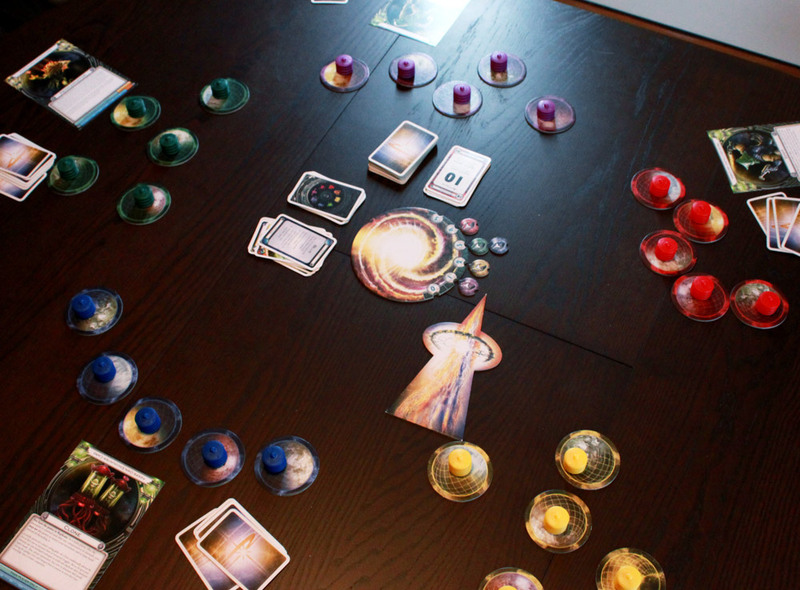 Yes, Cosmic Encounter has lasted this long for a reason, and it is quite possibly my favorite game of all time. It may not be as mechanically tight as some games, but it oozes zany fun, and it is entertaining every time I play, even when I lose – and I lose a whole lot. The game isn’t the simplest to explain – with 7 phases, and all those alien-power exceptions to worry about, I definitely field a lot of questions. However, I don’t mind as the game is pretty enjoyable to explain. (The answer to almost every question of “can you do [some action]?” was “No… unless you’re the [Alien Race.] It also helps that, despite the number of phases, the steps are pretty straightforward. Most of the phases don’t require a choice – they’re just a step to do. First you recover 1 ship from the warp, then you draw a destiny card telling you which system to attack, then you send your ships and target a planet, then you invite allies… these phases are not complicated or long. The alien powers are so much fun to play. The simpler, less exciting powers are often overall more useful, while the zany powers are fun to play even if they don’t give you a huge advantage in every situation. But the sheer number and variance of powers makes you develop new strategies each time you play. The same things just wont work every time. Sometimes you’ll need to ally carefully; sometimes you need to go on your own. Sometimes you need to save your cards, sometimes you need to blow through them as quickly as possible. You never know until you see what’s out there. The number of powers may seem overwhelming; but you don’t have to learn every power from the start. 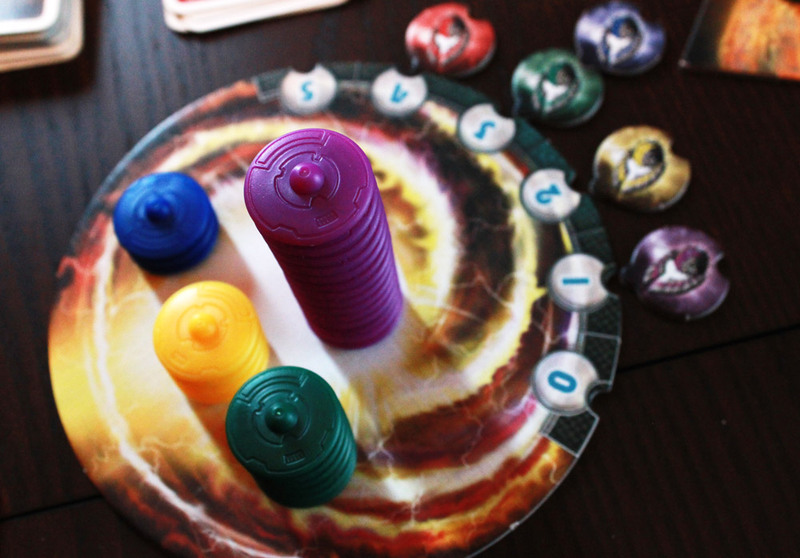 Each player has only one power and so you only need to learn the powers on the table. And each power is essentially focused on one element of the game. So, you don’t need to memorize a set of bonuses for each race; it’s basically just one thing. The race sheets included are helpful with this, having a short 1-sentence description at the top, facing the other players, so you can remind yourself what you’re up against with a glance. There are accusations leveled at this game that the powers are unbalanced. Let me be absolutely clear here: yes. The alien powers are unbalanced. Some alien powers seem impossibly strong. (Like that Virus, who multiplies attack cards by the number of ships.) It’s not fair. But it is fun. And you know what? It still works. The most important balancing factor is Alliances. That Virus may be nearly impossible to overcome, but if all the other players stick together, they can overcome him or her. Stronger powers will tend to find themselves fighting alone. Not that it will turn into a team game, necessarily; the other players will certainly go against each other at the right times. The Destiny deck helps balance things out as well; no player can simply choose where to go, so no one can automatically take advantage of the weakest player. It also helps that every mighty power has a caveat. Nothing is all-encompassing, so you have to look for weaknesses. That Virus multiplier is powerful… but then again, what is any attack card times 1? What about times 0? Targeting an empty Virus planet suddenly becomes quite appealing. Every power has it’s awesomes and its limitations. Even beyond that, there are cards in the deck – such as the Cosmic Zap – that cancel out an Alien’s power temporarily. Saved for a key moment, those can turn a hopeless scenario into a victory. And of course some alien powers simply counter the powerful ones, although there’s no guarantee any of those will be in play. But what’s a Virus going to do against the Loser, who wins with a lower attack total? Beyond the alien powers, one of the favorite parts of the game is just the back-and-forth dialogue the game creates. Table-talk is allowed and even encouraged, and there is plenty of bluffing, taunting, and negotiating to be had. You will try to convince the other players to ally with you; or to turn against someone else. You will try to get your opponent to negotiate when you can; always at the risk that they’ll stab you in the back and play an Attack instead. You will taunt and risk and taunt some more, and you will have a blast the whole time. It can seem like the game is based entirely on the luck of the draw; after all, the coveted Attack 40 beats almost any other attack, no matter how many allied ships you have. But aside from the few outliers, most of the cards are between 7 and 15, meaning you may desperately need those allies. You may try to bluff as if your card is super powerful, hoping that the other player will expect to lose and toss a weak card rather than waste something stronger. You can also try to get rid of your hand (having to give up compensation isn’t always a bad thing) so you can start afresh, or get cards by other means (getting compensation isn’t always a bad thing). You have to save the cards you have for the right moments, and your strategic choices, alliances, and card plays will make a difference in the end. Sure, luck can swing a victory one way or another, but that is true of most games. It’s nothing nearly as frustrating as bad dice rolls, and everyone is involved the whole time. That’s another important factor. Especially with a full group, it can be a while between turns. However, that doesn’t mean you have to sit there, bored. The alliances factor keeps everyone involved, and even if you don’t get invited you can still try to convince people to join with one side or the other; whichever works to your advantage. You may not be on offense very much, but you get to play the whole game. There is some element of “attack the leader” in this game. But, unlike many games with that kind of thing, this doesn’t push the game hours and hours longer than it should be. Losing colonies is pretty rare, and eventually someone is just going to win. The game box says the game lasts 1-2 hours. In my experience, most games actually take around 45minutes to 1 hour, short enough to fit in a lunch break. Occasionally, a game will run longer, but this is when players are allying heavily on the defense, or when defensive powers have a strong presence. The game rarely drags, and when it does go long it tends to be a tense, exciting experience. It’s also worth noting that you can win a shared victory. Two players at 4 colonies can ally to get the 5th, and they both win. This helps push the game to the end, instead of forcing 1 player to defeat every other player all at once. 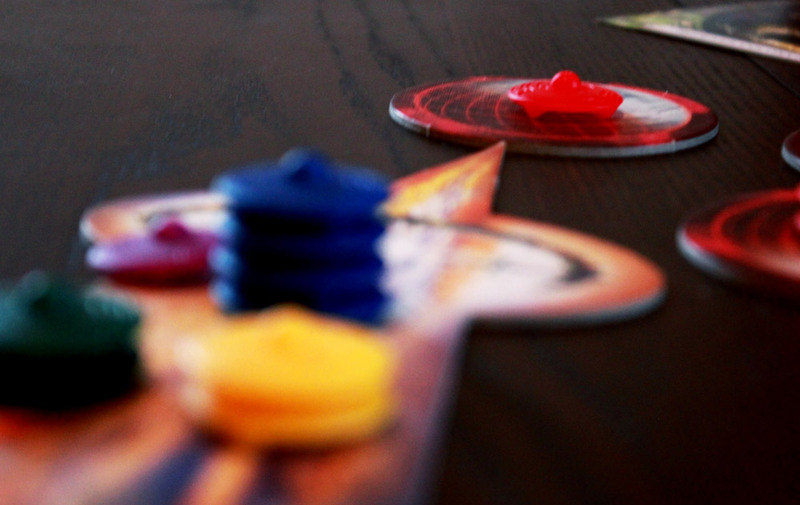 The game is best played with 4 or 5 players. The alliances are just such a key part of the game, it’s more fun when there are more players to go around. 3 is enjoyable, but with only 1 player who can possibly ally with anyone at any given time, there’s something missing. The production quality of the game is excellent. Quality design, excellent art, good cardboard tokens, crisp cards. The plastic ships are beautiful, and they stack up very nicely. There are enough tokens for the alien powers that use them. 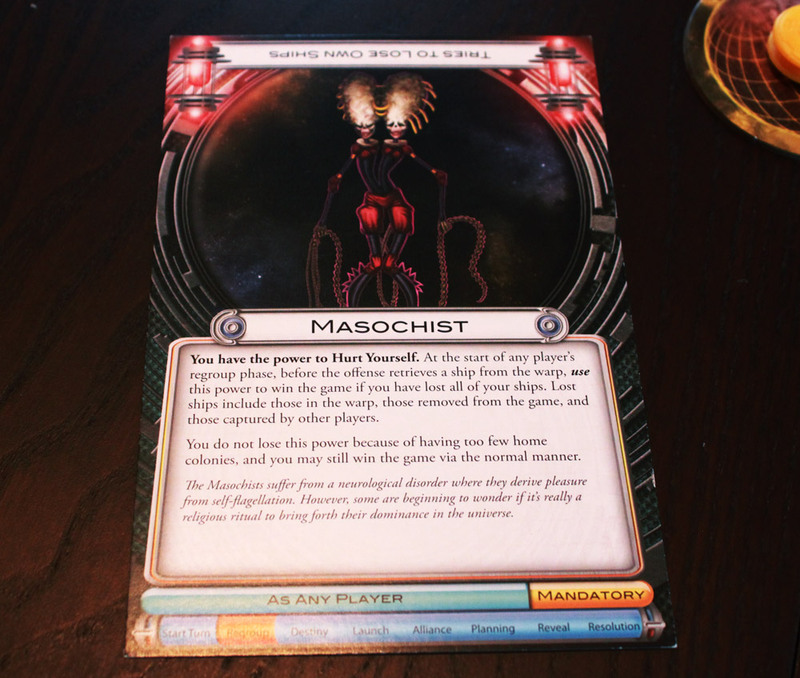 Cards come with helpful indicators of when they can be played; alien race sheets indicate their complexity level and clearly spell out the powers. The only real “issue” is the rulebook. It’s okay; nothing horrible, nothing stellar. It clarifies most situations, but it’s not always easy to find the rule you’re looking for. Fortunately, the game terminology used is well-established and consistent, which clears up most issues. 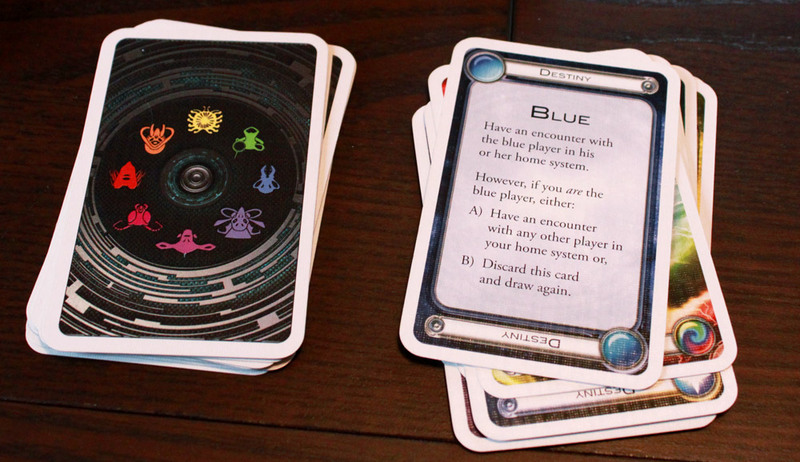 Like many FFG games, Cosmic Encounter includes a few variants to offer even more replayability, and a miniature expansion – Tech cards, which are powerful cards that have to be “researched” before they can be used. Tech cards add even more craziness. This game is simply excellent. It offers so much variety, so much zany fun. If there are alien powers or cards you feel are overpowered, you can simply remove them from the game and play something more balanced. But the imbalance works in this game; it creates a zany space story, and when you overcome that over-powered enemy at last, you feel like you’ve accomplished something. The game rewards well-planned strategy and the ability to adjust on-the-fly to unexpected circumstances. The social aspect keeps everyone involved the whole time. And I love the science fiction theme with weird art and alien descriptions and a zany 60’s era sci-fi vibe, with a few subtle references tossed in. (Humans are “Mostly harmless”). Next Article Look at me, I’m a winner! I particularly like the nod given to the aliens and their histories! Nice catch. I changed it.